A dismal and desolate valley2. A pencil that squeaks on a slate8! If only I've stated it thrice10." By reckoning13 up the amount. "Two added to one  if that could but be done,"
It said, "with one's fingers and thumbs14!" And watched them with wondering eyes17. And collects  though it does not subscribe. We have spent on the billowy31 ocean!" "Sally" is a specially well-chosen noun here. A sally can simply be a short journey, but it's primary meaning is a sudden charge to break out of or away from a besieged place. Chances are good the Butcher has not so much made a considered plan as fled with all speed as soon as the opportunity arose. In other words, he has gone off to hide where he thinks none of the other crew members will go. It's an odd choice on some levels, since a lonely and desolate valley is not the nicest place to wait for however long the snark hunt will take. This is probably a jab at victorian manners, in which two people of "manners" would never dream of openly expressing their dislike of one another. In real life as most of us know well, the "open expression" gets mutated into passive aggressive nastiness that can fill a room with a terrible atmosphere of suppressed rage. "Remark" and "mark" are curious verbs whose companion nouns show how their meanings have changed. A "mark" is a small scratch, stain, pencil line or whatever. When we mark something, we may be noting whether it is correct or incorrect, checking it off on an inventory list, or otherwise adding a stain or other discolouration to it directly. By rights, a remark should be a second mark added to the first and remarking should be marking again. That's just what these meant, apparently until the late seventeenth century. This may be related to more illiterate individuals working in areas where "marking" was required, so that first "to remark" became "to make a verbal observation" and "to mark" could be used similarly. As is typical in english, a verb that can refer to a verbal act of a specific type is soon generalized, so that now "a remark" is often understood to be a short statement of any kind as opposed to a short statement expressing an observation the speaker has made. Here the Butcher and Beaver appear to be doing the exact opposite of anyone who wishes to escape an ambush does, since the narrow end of a valley is an excellent place for an ambush. Worse yet, the light is failing. Various web searches I have made turn up people and websites insisting that "beaver tails" besides being literally appendages of a large, water-dwelling rodent that builds dams are a deep fried pastry traditionally eaten by canadians. I can't help but wonder which ones, never having seen or eaten such things anywhere in canada. (The strangeness of claiming there is a traditional canadian anything is a whole different question.) Real beaver tails are not usually as round as illustrators make them, though the Beaver's is quite accurate as drawn. The unusual appearance of the skin is true to life as well, and probably developed alongside its increased width and strength, as beavers use their tails to help them swim. The Victorian Web has an interesting introductory essay on the victorian cult of the child. It is probably no coincidence the idea of childhood innocence had its greatest currency in a time when crippling labour was the norm for the vast majority of children as soon as they could walk and go to the toilet on their own. Conversely, child labour laws were being brought in as well, and the traffic in child slaves, especially prepubescent girls into prostitution became openly discussed social issues. 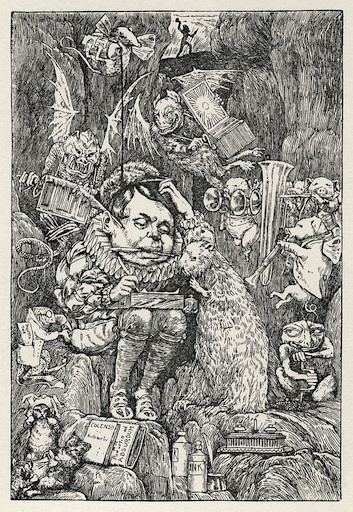 The present ideal in which children are shielded from the "real world" until they are grown up comes from this period as well, and in Lewis Carroll's time the boarding schools anyone who could afford it sent their boy children to were considered a sort of halfway house on the way to adulthood. Reading about the actual conditions in these schools makes it clear that only luck and money made them "refuges" or "pleasant intervals." It is still possible to track down framed slates of the type once common in every school until paper was cheap enough to replace them. The sound of a pencil squeaking on a slate is basically the same as that of a nail being run along a blackboard. Whether a person was using chalk or a proper slate pencil, they could suffer this awful sound when a bit of grit or other harder stuff worked its way to the surface of their writing instrument. According to MentalFloss.com, the vileness of this sound relates to its frequency, which falls in the range early studies of human response to sound suggest is both audible and consistently found unpleasant. However, beyond confirming people consistently find the squeaking type of sound made by squeaking slates and rubbing styrofoam, nobody has come up with a convincing explanation for why the sounds should be found why they should be unpleasant rather than something else. Being a migraine sufferer myself, I find that this type of sound is a kind I can literally feel in my ears, not just hear as a noise. This seems to me a key element of the unpleasantness, so I wonder if part of the issue is that there are elements of the spectrum of sounds in the squeak that are near to inaudible, but not quite by analogy with a noise considered neither pleasant nor unpleasant that becomes deeply irritating if you can just hear it but not tune it out. "Dunce" and its origins in the name of the theologian Duns Scotus is discussed in the annotations to Chapter 11 of Alice's Adventures in Wonderland. Once, twice, and thrice are all good words, though thrice has fallen almost completely out of use in contemporary english. All of them come from genitive forms of the cardinal number words "one, two, three" in middle english. A genitive form is best known as a form indicating possession such as "hers" or the spelling stumbling block "its". When english still had a strong inflection system, it was possible to use the genitive in a few other ways, especially to indicate removal or even origin i.e. something taken from a give source belonged to that source. According to Humpty Dumpty, "...'outgrabing' is something between bellowing and whistling, with a kind of sneeze in the middle" quite a spectacular noise for the Beaver to make. It sounds nearly as unpleasant as the racket they understand to be the call of a snark. It says a great deal that today english speakers may use this phrase with no idea what it really refers to, though the sense of working the brain hard to find an answer still remains. The "rack" was one of the many hideous torture instruments probably already in use by the romans and ancient greeks spread throughout much of western europe by the inquisition and men calling themselves "witch-hunters." To be racked was no trivial misery the victim could escape at will. The rack was basically a frame on which the victim was laid, then each limb was bound up separately and the bindings attached to winches. After that, the torturer could stretch the victim's limbs until they were disjointed or worse. So the Beaver is certainly doing its brains no favours here. The more usual spelling of "rack" is "wrack" in my experience, and according to my OED the form with w may be the original verb form created by adding the letter. "To reckon" means basically to count or calculate up something, and extends easily to mean estimate. So when someone "reckons on" or similar a given situation or person, they are sizing them up in some way. 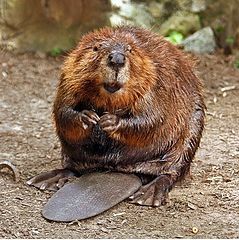 Beavers do have hands, and are among the small number of non-primates that do, including raccoons and muskrats. The picture below gives a nice view of a beaver's hands below  they are often labelled "forepaws" despite the separation of the digits and their mobility, probably because beavers don't have opposable thumbs. Apparently declaring something three times making it true extends to declaring an action making it true by enacting it as well. This is a good illustration of the sometimes deeply blurred relationship between speech and action. A portfolio most literally and most simply is a case for carrying papers, and can be little more than a couple of good-sized sheets of cardboard taped or clipped together. Anything used as a briefcase could be considered a more complex portfolio, and some, like the one the Butcher is shown writing on, could be made to provide a writing surface as well. As well the creatures might, since this peculiar couple is engaged in trying to write in the dark. Overall I find this the funniest and most interesting illustration of the group done by Henry Holiday for the poem. The creatures are a hilarious mix of the almost ordinary and thoroughly weird, including the lizard with a white coat on, a tax slip sticking out of his pocket, busy reaching into the Butcher's purse and its nastier cousin getting ready to drill a hole in the Beaver's tail. The strange books visible beside the Butcher are interesting in their own right, one being Colenso's Arithmetic and another with a cut off title ending in "...reductio ad absurdum." No doubt Martin Gardner has already thoroughly covered the probable references of these two books, still it's worth giving a quick overview here. A digitized copy of the 1886 edition of Colenso's Arithmetic Designed for the Use of Schools: To Which is Added a Chapter on Decimal Coinage; according to its front matter, this particular edition is not the first for the particular revision it is, as its reviser's preface is dated 1874. Colenso appears to have been a clergyman, and his textbook the standard for elementary school arithmetic for many years. "...reductio ad absurdum" likely refers to a philosophy-logic text as this is a common mode of refuting an argument. A famous application of it is to the proof that there is an infinite number of prime numbers. This is not an impossible feat, though in Carroll's time the pressure on left-handers to write with their right hand instead could be severe, including hand-breaking in some vicious cases. There was no rational reason for acting in such an appalling manner towards left-handers, only an intense superstitious insistence that to be left-handed was to be somehow inherently evil or easily influenced by evil. Such nonsense is still peddled in catholic schools in parts of canada. This sequence is reminiscent of a quick change artist, though there is no difference between the starting point and the end in this case. Don't be fooled by the various sources defining "quick change artists" exclusively as people who are able to change clothes quickly between acts in a play or other stage show. At best, that's a later understanding of the term since quick costume changes are simply a necessary skill of the trade if you are an actor or other type of stage performer. A quick change artist in the original sense is a small-time con artist who confuses cashiers into giving them more money than the con has asked to be broken down into change. A con artist who does this well does have a certain unpleasant skill, and can make life difficult for people who are genuinely confused about what change a cashier is counting out for them or when they want to request different coins or bills rather than coins because their questions and requests can be misconstrued by the cashier. Victorian era teachers were then, as all too often now, poorly paid, much of the excuse for this being they were mostly women. Many teachers worked as private tutors for more well-to-do families, and unless and until they had been hired, any interaction between them and potential students was probably sharply frowned on as they were strangers. Whether a teacher worked in a private home, a boarding school, or what in the victorian era were new day schools, they could be harsh "disciplinarians", though this was most likely for teachers dealing with larger classes. In such cases, people aren't kidding when they refer to "the rod and the birch," verbal abuse, systematic humiliation, and verbal violence in writing from this time period. Whether anyone likes it or not, such practices were no less common right down into at least the mid-twentieth century in england and the various colonies and former colonies of the british commonwealth and are still firmly entrenched in many places. There is a grim correlation between poor pay, large class sizes, and use of coercive techniques for room control by teachers. Quite apart from this aspect of schooling, just what paradigm the teachers were working within is well explained by Ken Robinson in his talk Changing Education Paradigms. "Passion" probably means "full of barely controlled emotion" here, though this is the first time the Butcher has actually controlled his emotions in the poem. As opposed to Butcher who is behind, in his tudor-era dress. There is another playing card connection actually, between tudor-era dress in particular and the court cards. The dress of all those kings, queens, and knaves are heavily stylized tudor-era dress. The knaves in particular are based on what would now be called "extreme fops", rich young men who deliberately wore costumes made up of items with many different and detailed patterns. "Charity meetings" being the sort of events involving a speaker who gives a talk on a difficult social issue, followed by collection of subscriptions, that is donations to the organization the speaker may be representing or funded by. To be a subscriber would mean giving a regular sum each month by automatic arrangement. Being a collector of subscriptions while not subscribing yourself is generally seen as rather hypocritical. Jars made of ivory would be quite an expensive item to have, and not necessarily the best choice for storing or cooking anything in. Since ivory starts out as the teeth of elephants, it is actually a relatively porous substance that can absorb smells and stains if not adequately sealed. Ivory is still considered a great luxury item, even though at last it has been formally banned in an effort to stop the decimation of elephants, which is still going on unfortunately. Different wooden kegs play an important role in the fermentation and mixing of wines and fortified beverages. Oak kegs are the source of the striking flavour in many red wines, fortified wines, and whiskies. Probably mahogany kegs have never been made, as mahogany is such a hard wood and not as common as oak. Condensing something means simply to concentrate or thicken it. A common item in cooking and even right on the table to be added to oatmeal or desert items until very recently is condensed milk. It is packaged in cans that can be stored for literally years. An "unmanned man" is a man who has lost, whether temporarily or for good, qualities designated "masculine." These usually include willingness to use violence to handle issues, and control and lack of expression of emotions. The billowy ocean is the ocean when it is especially wavy, moving about in smooth, giant ripples. For anyone who suffers from sea sickness, a billowy ocean is one of the most hideous prospects on the planet. "Spite" is an odd word. Fundamentally it means as a noun, "malice" and so as a verb, to behave maliciously. The use of "spite" here implies the expression "in spite of endeavour" meaning "in spite of efforts to avoid arguments." So even with such efforts, friends may argue. So what's going on here? Is the implication that periodically friends will act maliciously towards one another, or hurt one another even though in doing so they hurt themselves?